As promised in our precedent post, here’s some insightful data on the operating systems and browsers you guys have been using when creating and sharing beautiful dashboards with Jolicharts. 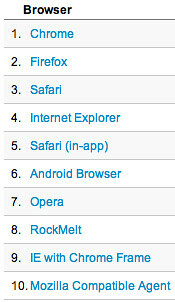 As far as browsers are concerned, Chrome, Firefox and Safari lead the way with high flying colors. When it comes to operating systems, Windows, which still has the most widespread and active installed base of users, clearly wins. In terms of dynamics, we can only confirm that if mobile usage haven’t yet taken over desktop and laptop usage, the trend is upward. However, we at Jolicharts tend to separate those who create dashboards who in most cases will use a desktop or laptop computer, and those who look at dashboards – and the latter are very likely to take the time to analyze data from their sofa with a tablet or in a waiting line with their smartphone. Time will tell whether our assumption proves correct.